Summer is right around the corner, and with it comes the debut of Camp Punk In Drublic. Created from the mind and liver of NOFX’s frontman Fat Mike, this one-of-a-kind destination event has punk music lovers and craft beer enthusiasts rejoicing. As the only punk rock campout in the country, Camp Punk In Drublic will feature performances by NOFX, Rancid, Pennywise, The Mighty Mighty Bosstones, Me First and the Gimme Gimmes, and more, along with a weekend of craft beer tastings (available for purchase), campfire stories from punk legends, and a slew of attractions including Fatty’s Midnite Matinee late night movie theater, carnival games, and much more. Located right outside of Columbus, OH, Camp Punk In Drublic will take over Legend Valley in Thornville, OH on June 1 (Friday Kickoff Party), June 2, and June 3, wrapping up the first leg of the national Punk In Drublic festival tour with a once-in-a-lifetime experience for punk rock and craft beer fans. June 1 (Kickoff Party): Me First and the Gimme Gimmes, Jello Biafra and the Guantanamo School of Medicine, and Guttermouth, followed by Campfire Stories with Fat Mike and NOFX. 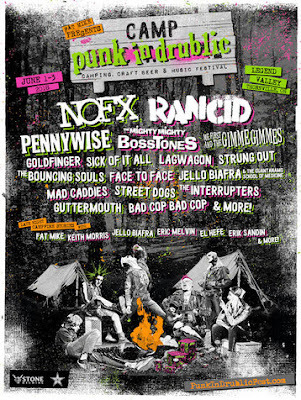 June 2: NOFX, Pennywise, Goldfinger, Strung Out, Mad Caddies, Face To Face and Bad Cop / Bad Cop, followed by Campfire Stories with Keith Morris, Jello Biafra and friends. Don’t expect things to die down once the music is done; this party goes well into the night. The venue will be open from 7:00 p.m. to 2:00 a.m. on June 1, 12:00 p.m. to 2:00 a.m. on June 2, and 12:00 p.m. to Midnight on June 3, and will be jam packed with all types of activities. Campers, get ready to check out the But Wait, There’s More festival attractions and march your lazy asses across the festival to Way The F*ck Over There for even more debauchery. Attendees 21+ with festival tickets can purchase a Saturday or Sunday craft beer Tasting Pass in advance for only $17.50 (plus fees). The Tasting Pass will allow entry into The Brews, where during the tasting, attendees can enjoy 15 3 oz. craft beer tastes, choosing from over 200 craft beers from dozens of top breweries. Some of the participating breweries include Stone Brewing, BrewDog, Lord Hobo Brewing, Great Lakes Brewing, MadTree Brewing, Avery Brewing, plus many more local and national breweries. In 2017, Fat Mike teamed up with craft beer pioneers Stone Brewing to brew their very own limited release Stone & NOFX Punk in Drublic Hoppy Lager for the debut of the Punk In Drublic festival. This marked the first time ever thatStone had worked with a musician for a can release. The lager sold out quickly in 2017, and now 2018 marks the first timethat Stone will re-release a specialty beer with a musician. Stone & NOFX Punk in Drublic Hoppy Lager will be available at Camp Punk In Drublic, in California, in this year’s Punk In Drublic concert states, and select surrounding areas. Use the Stone Brewing beer finder to search specific locations: find.stonebrewing.com. Early Bird General Admission tickets, V.U.P. ticket packages, and camping options for Camp Punk In Drublic will be available for purchase March 30 at 10:00 a.m. ET, starting at the following prices (plus fees). All tickets include access to view the music stage, and the Tasting Pass includes access to craft beer tastings (for attendees 21 years or older). Layaway plans are also available. Visit PunkInDrublicFest.com/camp for details on all ticket and camping packages. Weekend (Friday – Monday) camping add ons start at $99.50 (plus fees) for Tent Camping (for up to 4 people) and $199.50 (plus fees) for dry RV Camping (for up to 4 people). All camping options are for June 1 through June 4 and do not include admission to the festival unless otherwise noted. (Festival tickets must be purchased prior to camping passes.) Each camping purchase includes a Friday Kickoff Party Pass for up to four campers. Non-campers may purchase add-on Friday Kickoff Party Passes to attend the Friday Night Kickoff Party for $19 (plus fees) in advance or for $40 at the door. Fat Mike has again joined forces with premier music festival production company (and producers of award-winning breakout festival Lost Lands) Synergy Global Entertainment (SGE), and respected craft beer event production powerhouse Brew Ha Ha Productions for the festival. Legend Valley is a historic outdoor concert venue and campground that has been hosting music festivals and athletic events since the 1970s, including the award-winning four day camping festival Lost Lands. Legend Valley is located at 7585 Kindle Rd, just off I-170 on Route 13 in Thornville, Ohio. The venue is located about 25 miles east of downtown Columbus, OH, just a short drive from many parts of the Midwest. John Glenn Columbus International Airport (CMH) is also easily accessible for those traveling from other parts of the U.S. and the world.